Cat Chat With Caren And Cody: A Pre-Holiday THANK YOU From Neko Flies And Cat Chat!! Our 400th Post! A Pre-Holiday THANK YOU From Neko Flies And Cat Chat!! Our 400th Post! Cody and I were thrilled when we were recently contacted by Neko Flies (part of Nekochan Enterprises Inc.) informing us of some holiday specials that they wanted to offer our readers. Ellen (a multiple cat owner herself) was dissatisfied with toys available in the cat toy marketplace and decided to create a toy that would measure up to her and her cats particular needs. She started the creative process in 2007 to design a unique line of interactive cat toys and formed her company Nekochan Enterprises Inc. The company is named after her mother’s Abbyssian cat “Nekochan” (neko means cat in Japanese) representing the best qualities of Nekochan the cat and her cultural heritage. The Interactive Fitness Series is purrfect for home use, when you want your cat running and jumping during playtime. With Thanksgiving (in America) almost a week away and in honor of Cat Chat's 400th blog post, Cody and I decided to pounce on their offer with as much delight as Cody pounces on their toys and bring you some early holiday cheer! Some months ago we reviewed Neko Flies. As a THANK YOU to YOU, our readers, Neko Flies and Cat Chat are presenting you with this special offer! Kragonfly attachment plus Kittycada attachment, plus 22" rod. It arrives in sophisticated holiday packaging and is offered at a 36% discount! It normally sells for $25.00 (U.S. ONLY PLEASE) but the generous people at Neko Flies have offered the readers of Cat Chat a special discount code that is effective from NOVEMBER 15th THROUGH NOVEMBER 29th. The code is CATCHAT1 and when you type in that code at check-out you will receive an ADDITIONAL 10% OFF AND FREE SHIPPING!!!! That makes this the PURRFECT GIFT! Not only will your kitties be experiencing interactive play and exercising but YOU will be jumping up and down with joy at being able to purchase a fun, superior quality package for UNDER $25.00!! 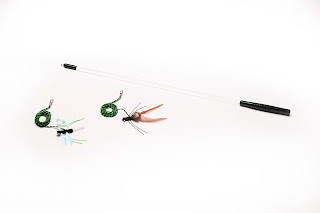 The COMPLETE six piece package of Neko Flies which includes: Neko Flies rod plus Katarantula, Kragonfly, Small Kittenator, Kittycada and Large Kittenator attachments. *****The discount code listed above is NOT applicable for this package. Once again Cody and I THANK YOU for sharing 400 posts with us! We hope that you will be with us for many more!!! THANK YOU to Neko Flies for this wonderful offer for our readers! *****Cody and I weren't compensated in any way for this post. We were contacted by Neko Flies and were offered the discount code to share with our loyal readers. We hope you will take advantage of this amazing savings! I haven't tried those but they sure do look like fun. My kitties are so lazy, though. They used to love playing with their mouse-on-a-string and now they just halfheartedly lift up their paw and bat at it. How cool! Are the discounts for US customers only? Awww !!!! Cody , you are so cute in da video !!!! and Concats for 400th post !!! and Thanks a lot for discount ! Congrats on your 400th post - that's quite an accomplishment! You're going to laugh when you see what I'm posting about today. Congrats on 400 posts... Wonderful blog! Congratulations on your 400th post! We've seen the Neko flies in a local store, but the mom says we have enough toys we don't play with. LOL. @Julia Cody is BEYOND lazy and he ADORES this toy! He goes to the drawer in the bedroom and meows and stands up trying to open the drawer. I would give this one a look! @Fuzzy Tales thank you! I am telling you that this one they WILL play with! @Max awwww thank you soooooo much! @abigail yay!! You are welcome! I hope your Mom gets it for you! It is a SUPER GREAT DEAL! @Ingrid..OHHHH NOOOOOO!!!! LOL! I think I have an idea! lmao!!!! I am going out with a girlfriend (an attempt to "center" as we discussed!) so I might not see your post til later this afternoon but I have a pretty good idea LOL!!! Thanks so much for the congrats!! @Mr Puddy awww THANK YOU!!!! Don't be mad but the discount is for U.S. only :( ((((((hugs))))) back! Congratulations for the 400th post!!! You did very well with you mom, Cody! Love to watch your video too. You are a cutie! @Priscilla thank you!!! That video is actually from March of 2011. The place was a mess because we were painting and that ugly orange chair is GONE! Caren, we're purring with excitement over your 400th post. Well done and congratulations! We love Neko flies but improvised our own natural wand after mom sat on ours and it snapped in half. Step up folks! These toys are really wonderful! The little critters do have a fascinating and realistic movement that grabs a cat's attention, and the little bodies seem to be quite satisfying for cats to bite. 400 posts? WOO HOO! Here's to 400 more! Cody! Me is in loves with yous!!! And, what a great give away for your 400th blog! Me shall heaf over and has a look! Guess what - you just convinced M to get one of those for me. Finally!! I've been asking for it for ages. Thanks buddy. Congrats on your 400th post. That is so exciting. That Neko fkt toy does look like fun. Mahoney and Maggie would love that. We will have to save up our green papers. Have a great day. Being that we are senior kitties, we don't tend to play too much, but that doesn't mean we don't get in the occasional swat at each other or even at a random string. We love growling at the dawgs and think that they might enjoy these toys (they have loved a bit too much on the little nip chipmunk we received so I wouldn't be surprised that they might want to play with these toys). That book Confessions of a Catnip Junkie looks really funny and we will definitely get that once we convinced MOM to let loose the purse strings! Congrats on 400 fur sure, that's a lot of paw tapping! If I don't get one a them flies for Krissymouse there is going to be hell to pay. @Layla thank you!! There is nothing wrong with making your own toy, I am sure your kitties love it just as much! @Spitty lol!!! I sure hope you get one! @Brian you always say the best things! lol. "That's a lot of paw tapping" I LOVE IT! @Tillie and Georgia I couldn't agree more! @Cat and the Coffee Cup, that is Cody's favorite toy! @Kitcaboodles awwww thank you! Glad you enjoyed it! @Marg thank you! I noticed you entered to win one on Ingrid's blog, I hope you are the lucky winner. I apologize but sadly we were not offered the option of doing a give-away or I most certainly would have done one. @Mario i am THRILLED that you are getting one! That is great news! you will have to let me know what you think of it! @meowmeowmans thank you! I sure hope Santa does bring you one! @GJ thank you!!! OMC that toy is fabulous! It is truly Cody's fave! @Hilary YEP! (I should have mentioned that that was also with the help of some friends! As in guest bloggers too!) but regardless it is still 400 posts! Thank you! @Jennifer thanks! They most certainly are. Thanks for offering your endorsement! @Benny and Lily THANK YOU!!! I am sure your kitty friend will like it too! @CRichman awwww thank YOU for making ME smile! Great to see Cody in action on the video! We just got home from a wedding in Toronto... Our felines are so happy. They love the cat-sitter but that's not the same as their own human parents!